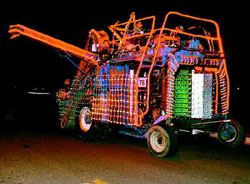 Don't miss the farm-implement parade in Sunnyside, Washington on December 5. That is, the Christmas parade of lighted farm implements. Unique. You have time to plan to be in the Yakima Valley on December 5. Photo from Sunnyside Chamber of Commerce.